Dogs to save our health again! Here is an interesting article from the BBC. Dogs will rule the world one day! They really are our best friends. 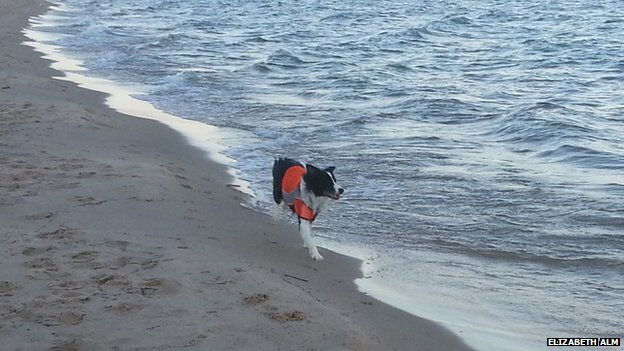 Researchers found that the hard working sheep dogs were successful at keeping seagulls away from beaches. Gull dropping are known to be a source of E. coli bacteria, which can lead to abdominal cramping and diarrhoea in humans. High levels of the bug are a leading cause of beach closures in many parts of the world, including the UK. The bacteria are commonly found in human and animal faeces and can end up in the seas through rain water run off or from sewage. Seagulls have been implicated in the spread of resistant versions of the bug. A recent report showed that around a third of E. coli samples taken from the birds were resistant to more than one antibiotic. This entry was posted in News and tagged bacteria, beaches, dogs, E.coli, infection, seaguls, seashore by Donna. Bookmark the permalink.